Predictably, this chili is as delicious as you would expect after reading through that description. I love the colors of this thick and savory chili, those rich dark reds, the flashes of orange carrots, and the sprinkle of seasonings. The huge amounts of cumin and spices amp up the other flavors, while the dill and lemon add a bit of an acidic zip. I’d never before added cocoa powder to a chili, but after this batch, will do it to every chili to follow. Although not specifically mentioned in the ingredients listed in the novel, the cocoa deepens the flavors of the chili, and could potentially account for Shadow’s inability to really recreate Laura’s recipe. Cook over medium heat for at least an hour. 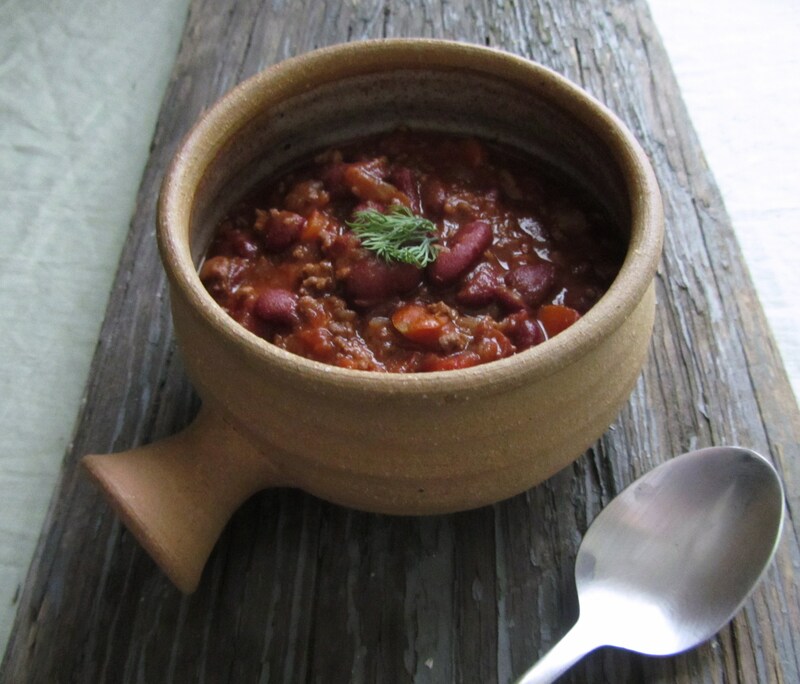 As with most stews and soups, the chili is much better the next day. Love it 🙂 I don’t know this story though! But I love that you were able to put the pieces together and figured out a great recipe from it! Chili takes to cocoa fairly well; think about molé sauce, and how it gets that rich flavor. Another idea that I’ve done, and had turn out well, is to add peanut butter. You get sort of a southeast Asian flair, and it is truly excellent on hot dogs. As it’s finally getting chilly in these parts, I might just have to make up a batch of this.